Effects: antispaspasmodic, expectorant, antiseptic, deodorizing, diuretic, antibacterial, antiviral, antiseptic, regenerating, febrifuge, immunostimulatory. Benefits: It is used in medicine for treatment of respiratory ailments. Often used as a decongestant in steam inhalations – its fresh, resinous aroma with citric notes relieves breathing in colds and sinusitis. 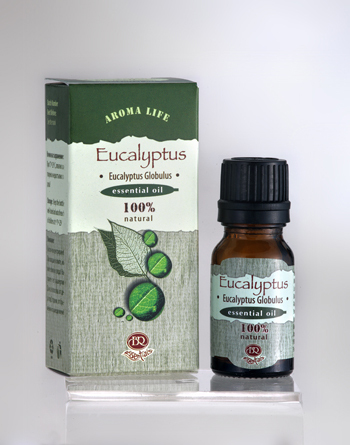 Solution of eucalyptus oil is used to gargle angina throat, thus eliminating the pain and inflammation. It has an antiseptic effect on acne, herpes, boils, burns, wounds, frostbites, insect bites; It is helpful against dandruff, hair loss, brittle nails; Blended in creams and ointments helps with arthritis, radiculitis, rheumatism, muscle pain; Psychologically, eucalyptus is energy stimulating, helping to overwhelm any physical weakness and misbalance. Blends well with most of the floral and citrus aromas, as well as with some spices. Use: aromalamp, inhalation, gargle, air fresheners, sauna bath, massage. Attention: Contraindicated for epileptics, hypertonic patients, nursing mothers, pregnant women and children, as well as people with individual intolerance to eucalyptus. Oil with very strong action! Not recommended to be used together with homeopathic remedies! Phototoxic at direct contact with the sun.